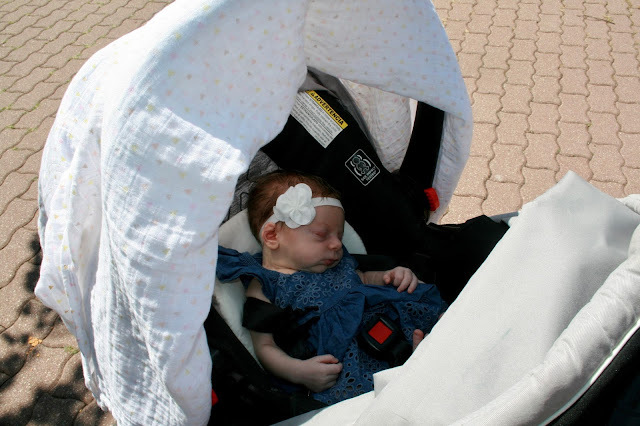 Last month when I was visiting my children in Illinois, my daughter and I took the baby on her very first outing. 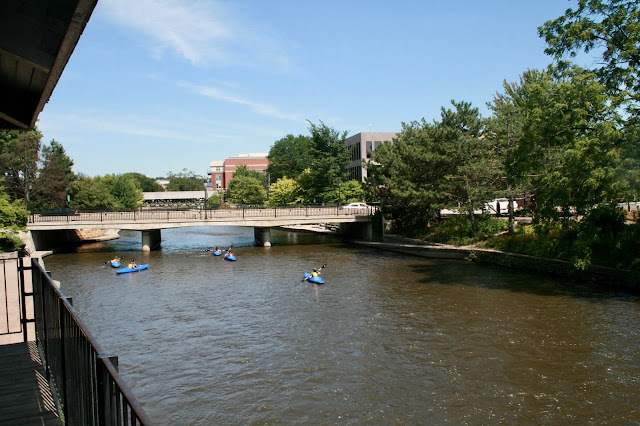 We went to Naperville, Illinois to enjoy a day of shopping, food, and a relaxing river walk. Naperville, Illinois is a gorgeous town! It has won a lot of awards too! In 2010 it was ranked the wealthiest city in the Midwest and the 11th wealthiest in the nation for a population exceeding 75,000. I'm sure that's because it's so close to Chicago! It has ranked as one of the safest cities to live in according to USA Today and Business Insider. In 2006 it was voted the second-best place to live by Money Magazine. 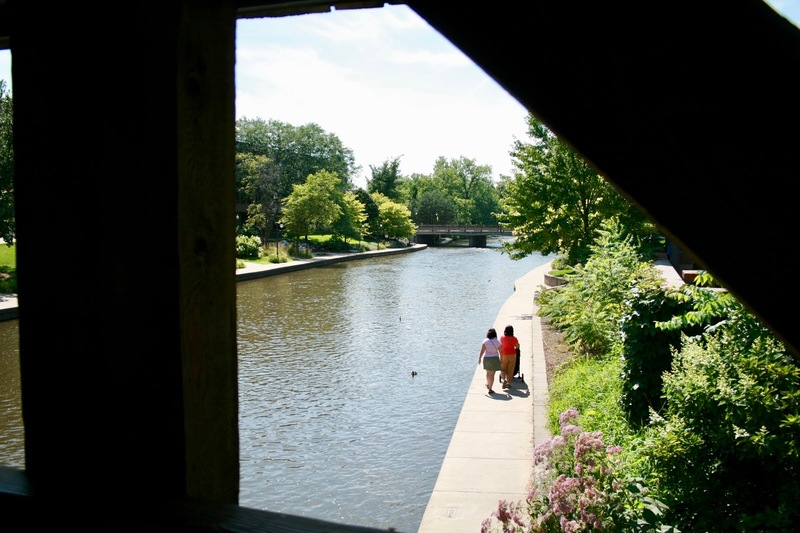 And it was rated #1 on the list for best cities for retirement by Kiplinger in 2013. Wow. That's a lot of accolades! But after spending just a few hours there on a beautiful afternoon, I can see why! 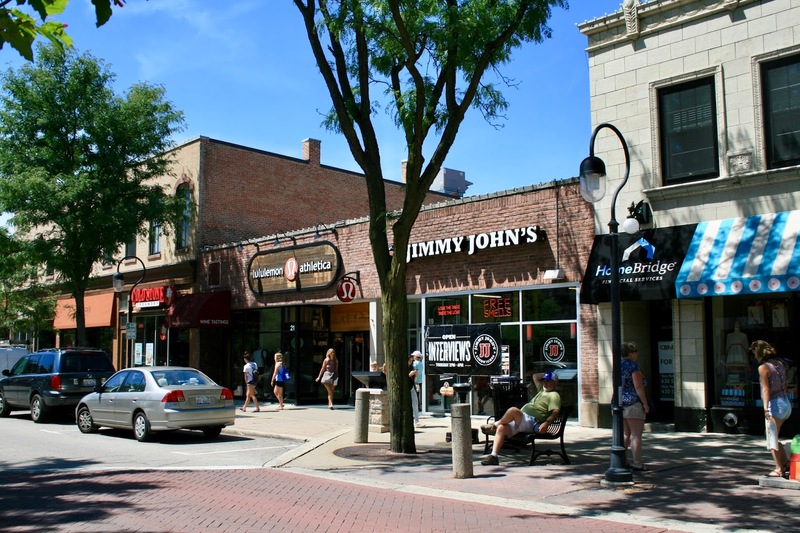 Like most cities, Naperville has a historic downtown shopping district. But the biggest difference from this cities' downtown and others I've seen...it's thriving! 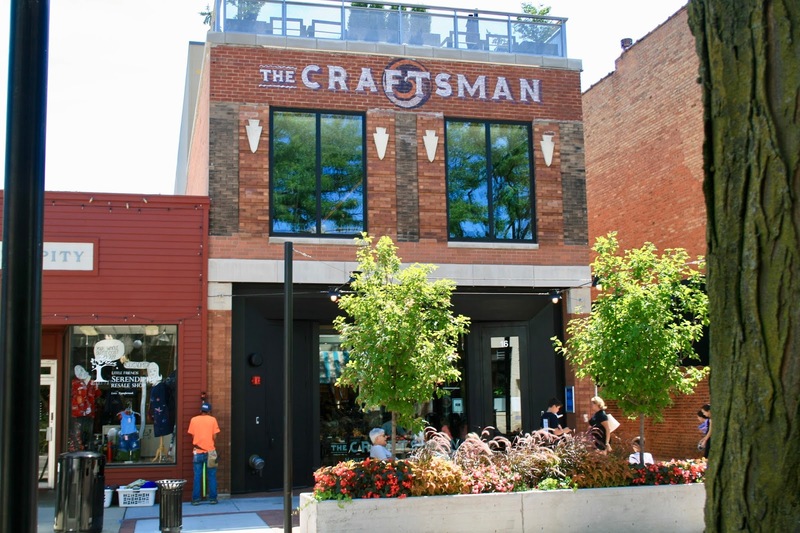 There were no empty store fronts, and there were plenty of people shopping and enjoying all the restaurants. 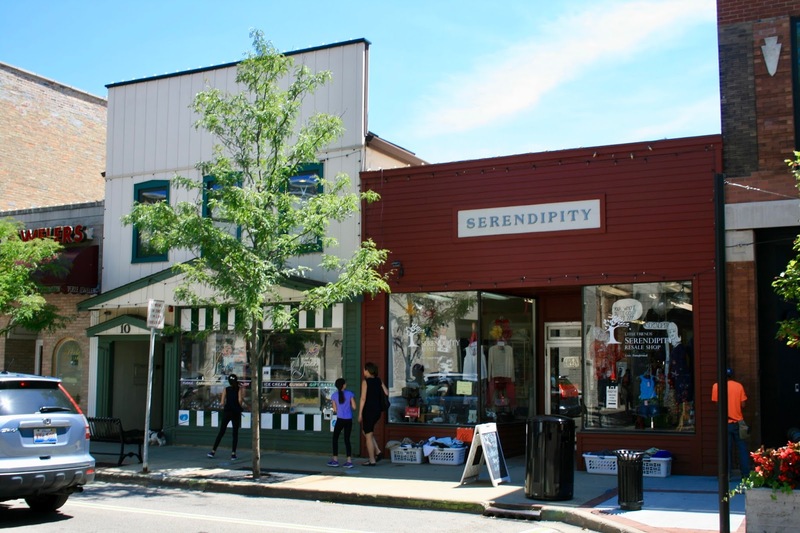 The stores were not the typical gift-shop menagerie one sees in most downtown's. It was a good mix of "real" stores like The Gap and Sephora along with a local thrift shop and other private businesses. The restaurant selection was also a good mix offering affordable chain restaurants like Jimmy Johns and Noodles & Company to higher priced private establishments. I loved this building! It was a restaurant with outdoor seating on both the sidewalk and on the roof! After stopping at a few stores, we chose a local Mexican restaurant to eat at. We really wanted to eat outside and enjoy the beautiful day. They had cafe tables and chairs set up on the sidewalk. Would you believe I never ate on at a sidewalk cafe before? I've always wanted too, but for some reason never had the opportunity. So now was the day! It was so much fun. And it was super nice and convenient to keep Alethea in her stroller outside. The name of the restaurant is "Front Street Cantina". I ordered a Tostada that came with a side of beans and rice. Ashley ordered Black Bean Soup. Everything tasted delicious and the service was excellent. We had the cutest, most charming waiter...he was just a young man so I felt very comfortable telling him how handsome he was. You should have seen him blush! He seemed to really appreciate the compliment. My daughter laughed her head off and said "He enjoyed that!" After lunch, we headed for the Naperville River Walk. 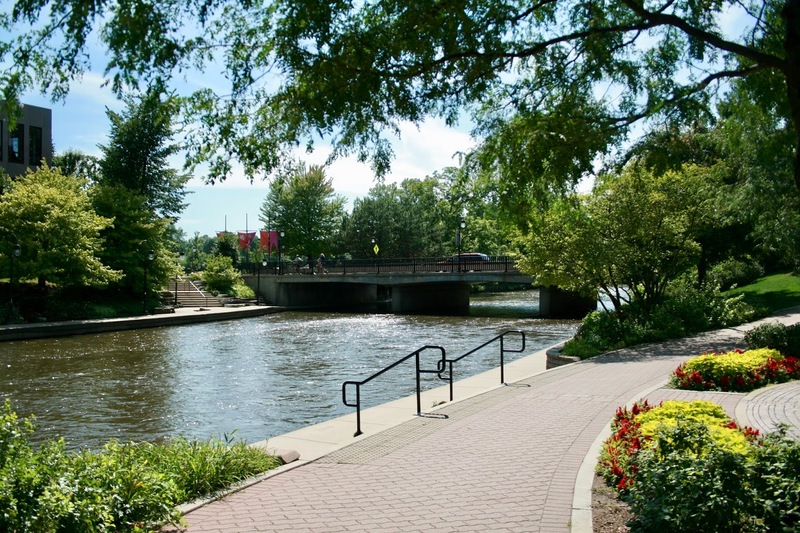 Considered the "Crown Jewel" of Naperville, the river walk is 1.75 miles of brick paths, fountains, bridges, meeting and event places, outdoor sculptures and artwork, recreational facilities, and celebratory memorials. 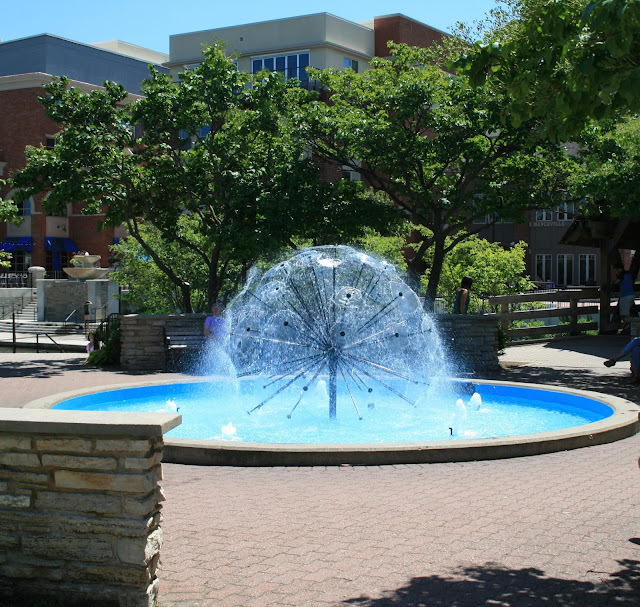 At the start of this river walk from the downtown area, is this pretty fountain. You may remember this spot from my "Grandma and Me" post. The Naperville River Walk is one of the prettiest river walks I've been too. What I loved about it was it times it seemed you were in the country, exploring a pretty forest and creek, and yet it had all the conveniences of a city. It was the perfect mix of city and country. This is an amphitheater. 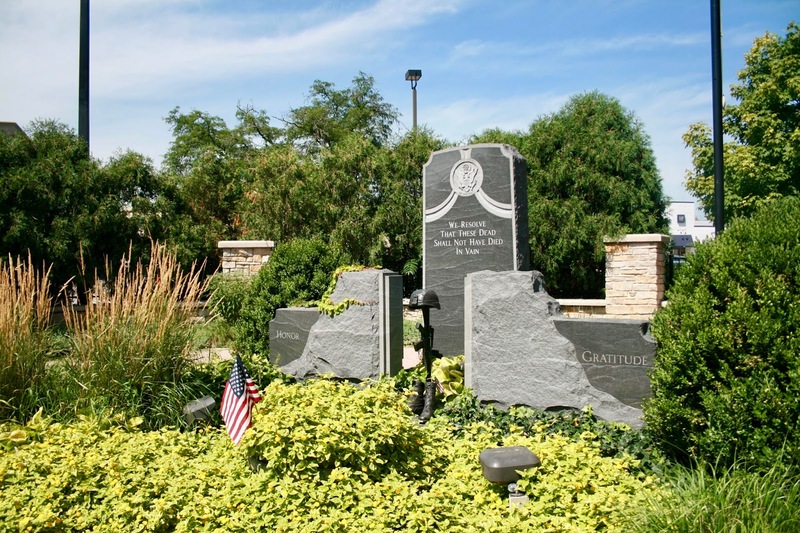 There's a small staging area on the bottom, with elevated steps/seats for viewing, and a memorial above. Free programs are offered here year round. It's also a place for rest and relaxation. 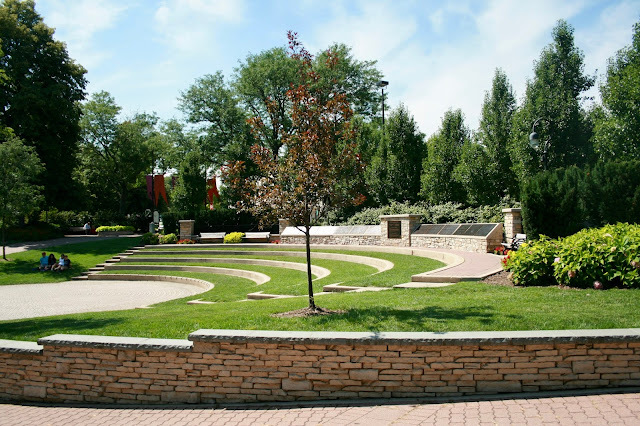 Behind the amphitheater is Millennium Wall. 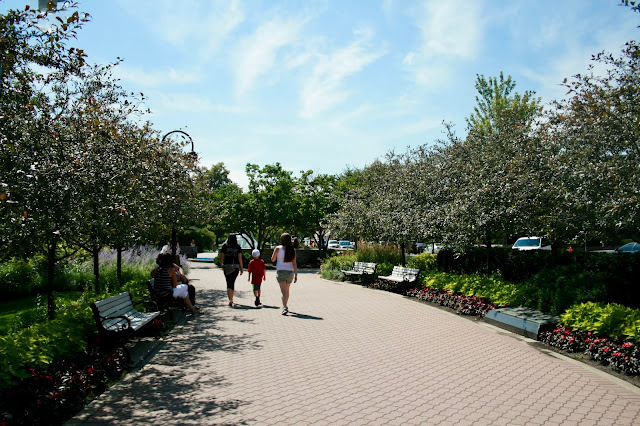 The wall is inscribed with the names of everyone who contributed to Celebration 2000: a citywide festival held to welcome in the third millennium. 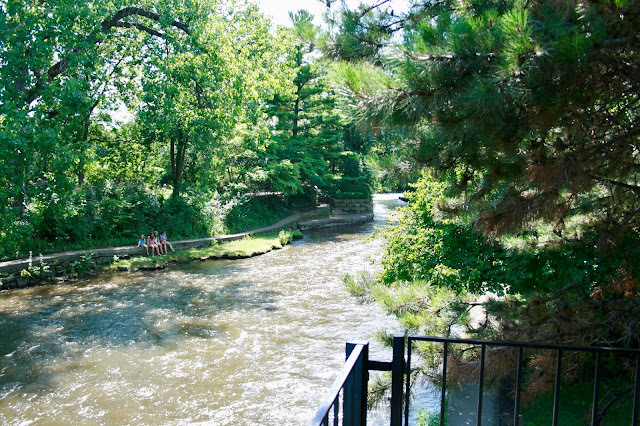 You can enjoy the river walk from two levels. A stunning brick path above and another path close to the river. I can't swim, plus we had the baby in a stroller, so walking on the lower path made us nervous, thus we stayed on the upper path. 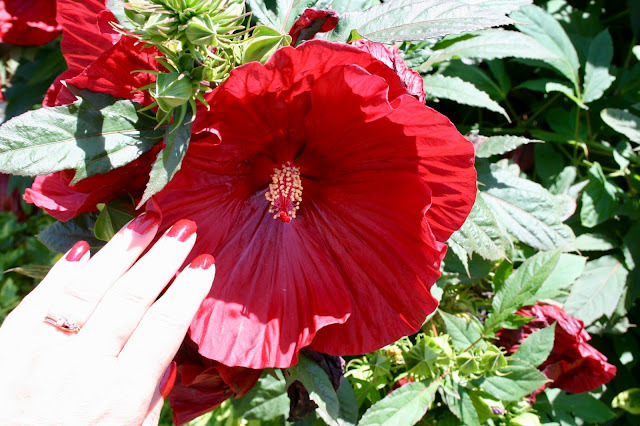 There were beautiful flowers and flower gardens everywhere. 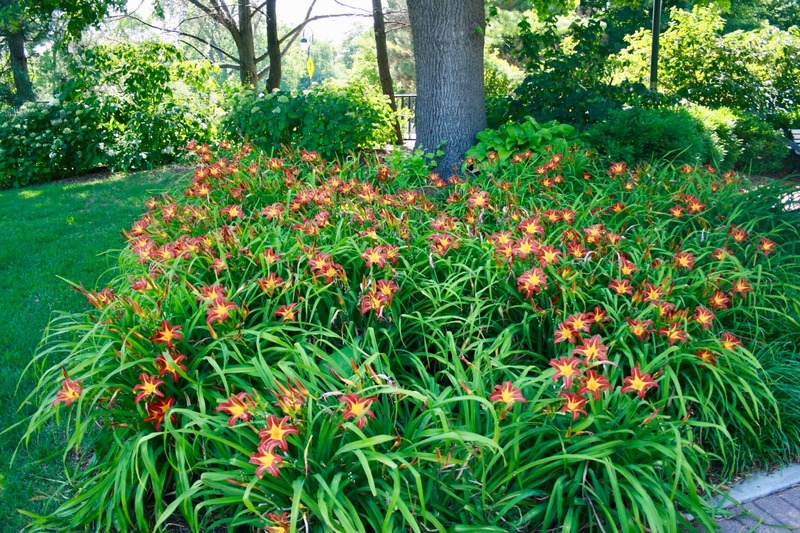 I loved this bed of day lilies! 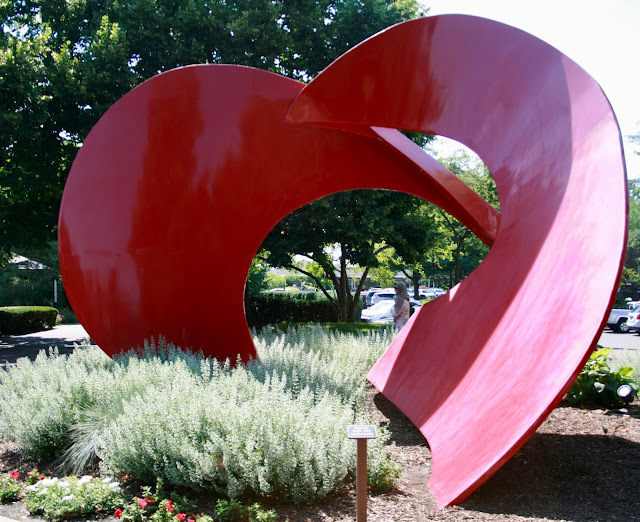 A lovely heart sculpture with a garden bed of flowers below. Look at the size of this Hibiscus flower! And how about this unique white one? The beautiful brick paths bordering the gardens made the flowers look even more beautiful. And what do you think of the shepherd hook lanterns? 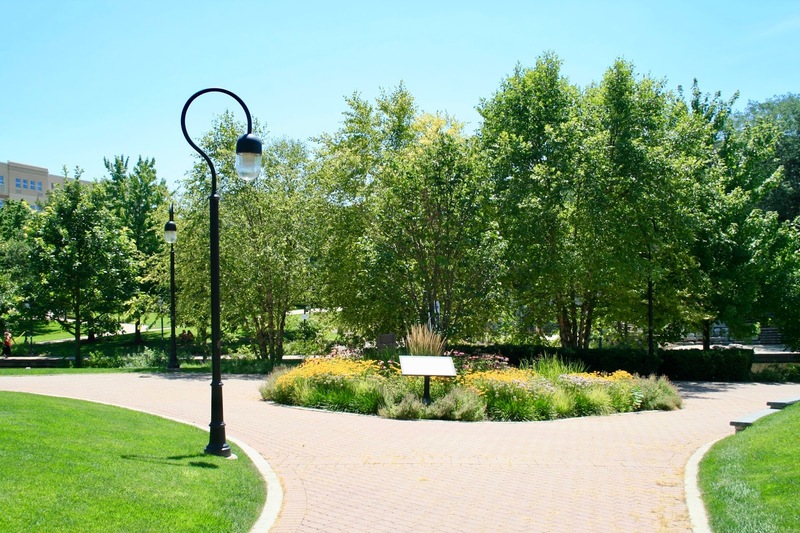 Along with the covered bridges, fountains, and landscaping, the lanterns are symbolic of Naperville's ties to it's historic past as the oldest settlement in DuPage County. This was my favorite fountain in the park. I thought it was so unique and fascinating. 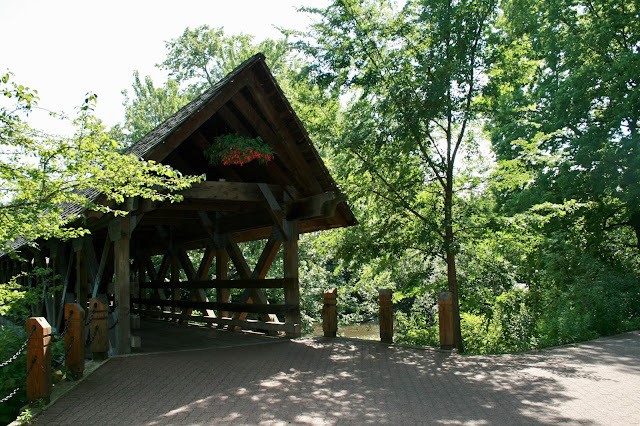 The mix of old and new, modern and historic was prevalent throughout the walk; like the modern, updated building on the left with the covered bridge in the distance. 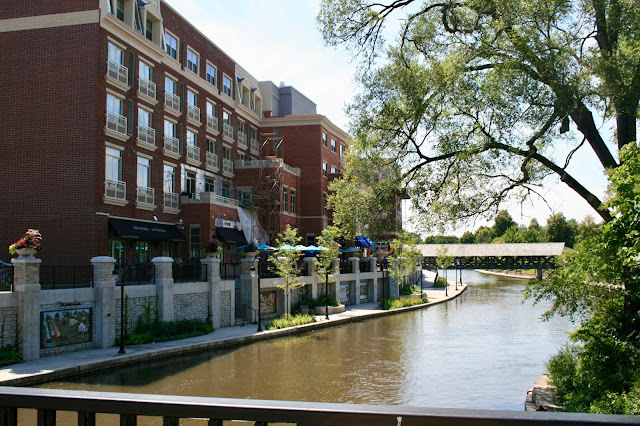 This was a restaurant at the start of the river walk in downtown Naperville with both rooftop and river side seating. It looks so fun! I would love to eat there someday! 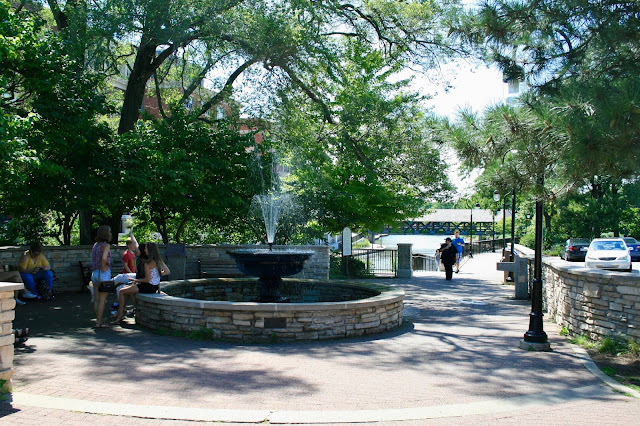 The River walk also has a Veterans Plaza. Can I say again how much I loved these wide, beautiful, brick paths? A couple of views of the river looking from the covered bridge. Little Alethea must have enjoyed the smooth brick paths as well. She slept through the entire walk! This area was so natural I almost forgot I was in an Illinois city for it seemed I was in a forest in upstate Wisconsin instead. Isn't it gorgeous? What a tranquil place for people to get away from the cities hustle and bustle and spend some time in nature. 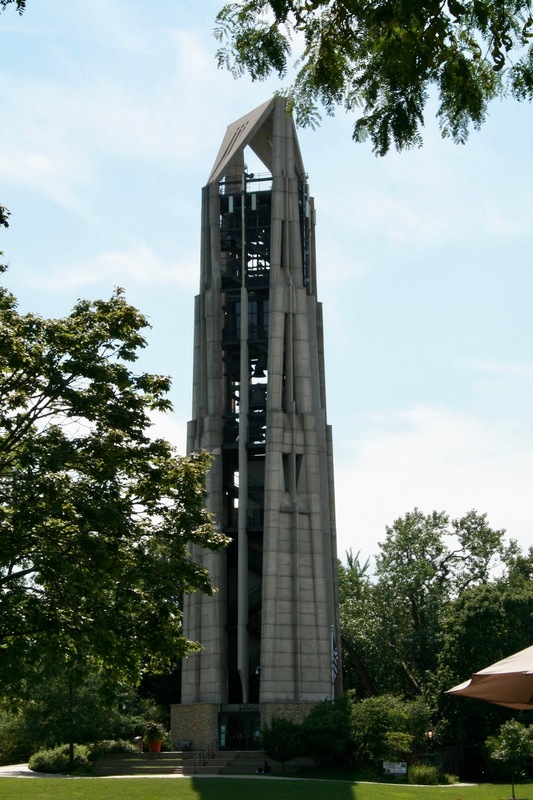 This is Moser Tower. It is 160 feet tall...10 feet taller than the Statue of Liberty. You can climb the 14 stories to the open air observation deck and enjoy the views. I didn't do it while I was there because we had Alethea, but I would love to do it sometime! Then again, maybe not. I'm terrified of heights. We saw some people kayaking down the river. They brought their own kayaks to be able to do this. They do have kayaks and paddle boats for rent too but those are limited to an enclosed lake. 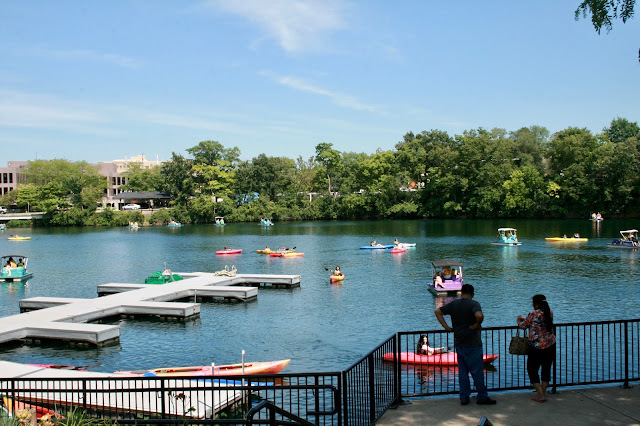 Here is the enclosed area where you can rent boats. 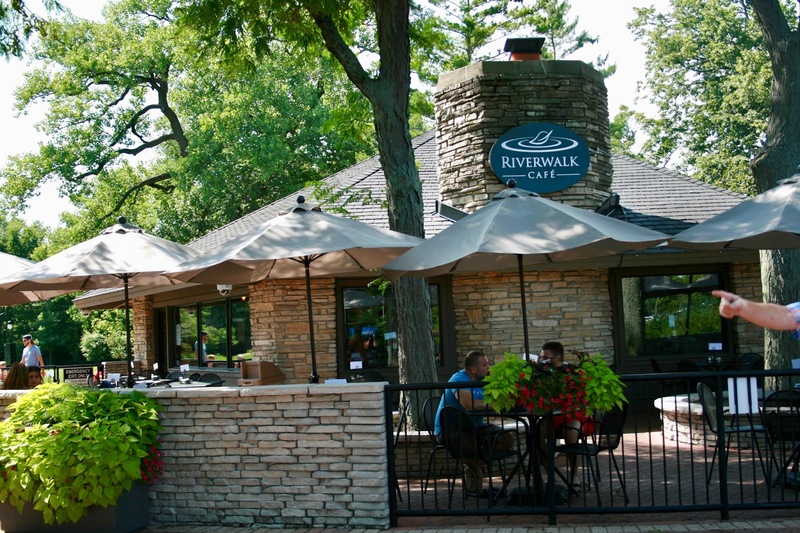 This restaurant, which offers both indoor and outdoor sitting, has a beautiful view of the lake above. This is Centennial Beach; a swimming hole on the Naperville River Walk. It is very unique. 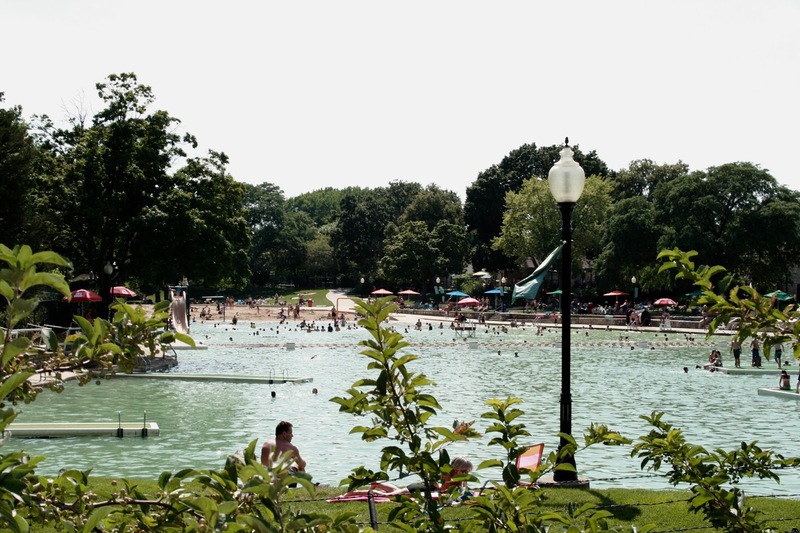 It's an abandoned quarry with a sand beach, slides, diving, beach volleyball, and casual eats. Well I can't end this post without including a few pictures of some of the amazing homes I saw in Naperville. 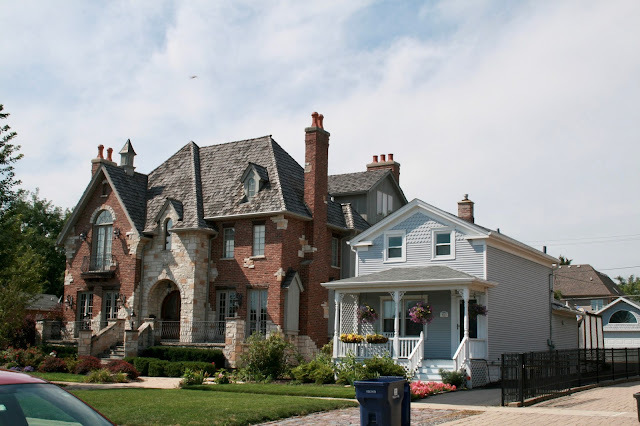 I stated in my opening paragraph that Naperville was a very wealthy city, and you can definitely see that wealth reflected in the homes. 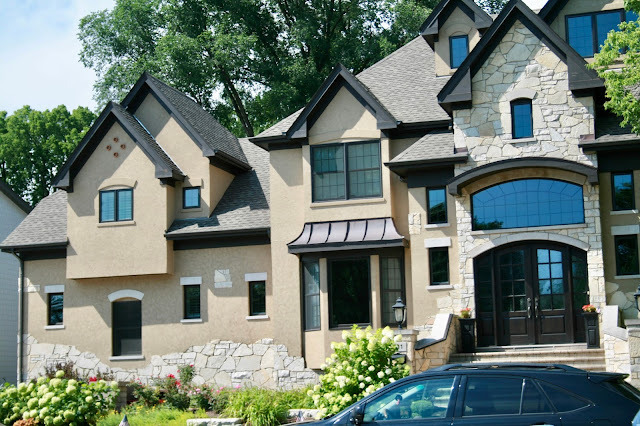 I loved this Tudor style home. 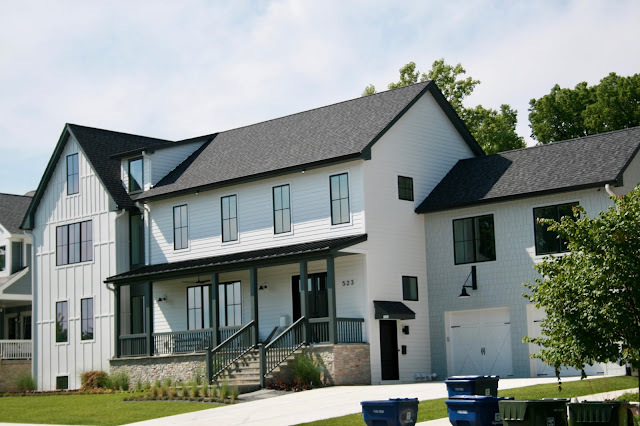 I thought this modern industrial farmhouse style home was very unique. The site of this grand home next to this simple one cracked me up. I love both homes and think they are both beautiful, but I said to my daughter if I had to choose, I'd pick the little one. It's just so cute, and far less maintenance than the other one! this place looks so cute! 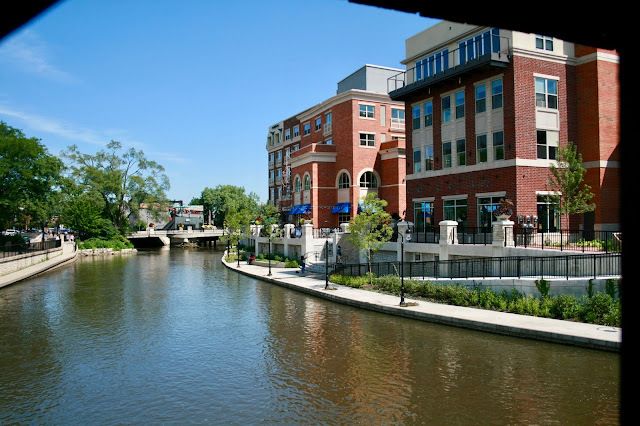 i've never visited naperville before but definitely need to check it out! Thanks Kileen, it is a cute town! I've been to Naperville a couple of times for immigration reasons, but never been to the river walk. I really should talk hubby into going just for fun, it looks so pretty there and we're only 2 hours away! The mansion next to the little house does look funny, but they are both beautiful and look well taken care of. But, wow, so close to each other! Loved eating at sidewalk cafes and outdoor restaurants in Europe, they aren't so easy to find here in the States and then it is usually too hot to enjoy them. Glad you had perfect weather to enjoy the outdoors! Oh, yes Elli, you should. It would be such a fun day, and you could take the kids to the pool! That is so funny that the city even allowed a huge house like that to built on a small city lot right next to the little house. It is so odd looking. I remember when I was in Italy, outdoor cafes were plentiful, but not so much in the states unless you live in a warmer state. Aww, thank you. Out of all the topics my blog covers, travel posts cost the most work to do and I'm often tempted to stop them, but they preserve my memories...so I continue on! You have been visiting some fabulous places lately Amy! Napersville sounds like a city to visit! Thanks Brooke! Just discovering America! I know I've said it before , but you have the funnest trip!! One of these days, we are going to travel to these great places!! Jodie, you LIVE in a great place! I would love to live in Colorado...theres so much to see and do there. Sounds and looks like such a fun day together! It was! Thank you Amy! 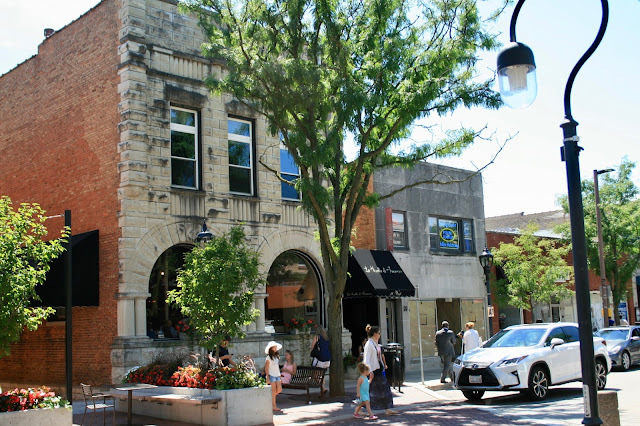 Naperville does have the cutest downtown. It's really changed over the years! 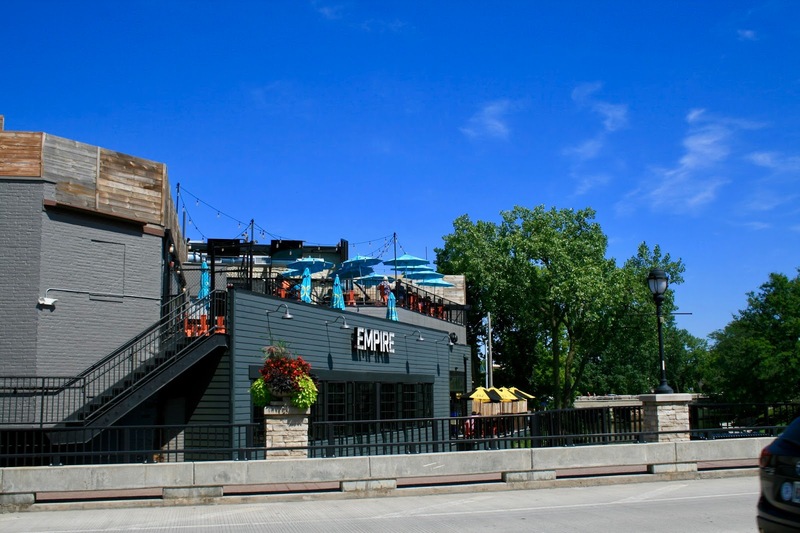 I would have loved to have seen the "before" Naperville. What a cute little town! Looks like you had so much fun! Thanks Shannon! It was a lot of fun!